For the first time, geologists are peering deep inside an active volcano to understand how eruptions occur. New technologies are playing a key role in controversial oil and natural gas drilling on the North Slope of Alaska. Lake sediments around the world are providing a wealth of information about past climate and regional change. Following up on more than 40 years of ocean drilling, a new international program plans to take ocean exploration to the next level. Scientists met in Los Alamos, N.M., to weigh the pros and cons of pursuing more drilling, in order to understand climate change history at this famous geothermal location. The December Bam earthquake  which killed more than 300,000 people in Iran  underscores the importance of earthquake mitigation in developing countries. The upcoming election might not bode well for bipartisan cooperation and could mean more trouble for funding the geosciences in 2005. 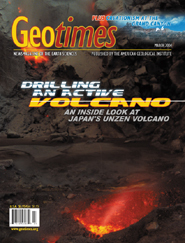 Geologists have more responsibility than ever to communicate the reality of the global energy situation to the public. Assembling the components of the EarthScope project is a challenge of continental proportions. From 1991 to 1995, Unzen Volcano in Nagasaki Prefecture, Japan, violently erupted. 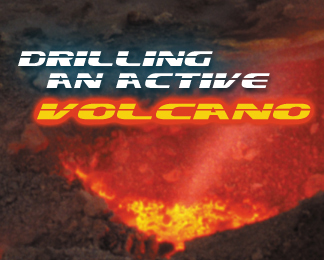 Now geologists are drilling into the volcano to learn more about how magma rises to the surface. This picture of an Unzen fumarole and nearby lava was taken by Hiroshi Shimizu, professor of seismology at Kyushu University.